Discover your child's potential. Learn from the experts on how to help your child achieve his goals and make his dreams come true. Psychologist Randy Dellosa will give a talk on How to help your child become an achiever. Workingmom magazine editor-in-chief, Ms. Dedet Panabi is also one of the invited speakers. TV Host Patty Laurel will host the said event. 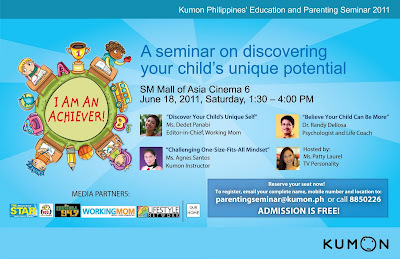 Attend this free parenting seminar on June 18, 2011 at SM Mall of Asia Cinema 6. Admission is FREE but registration is a MUST. 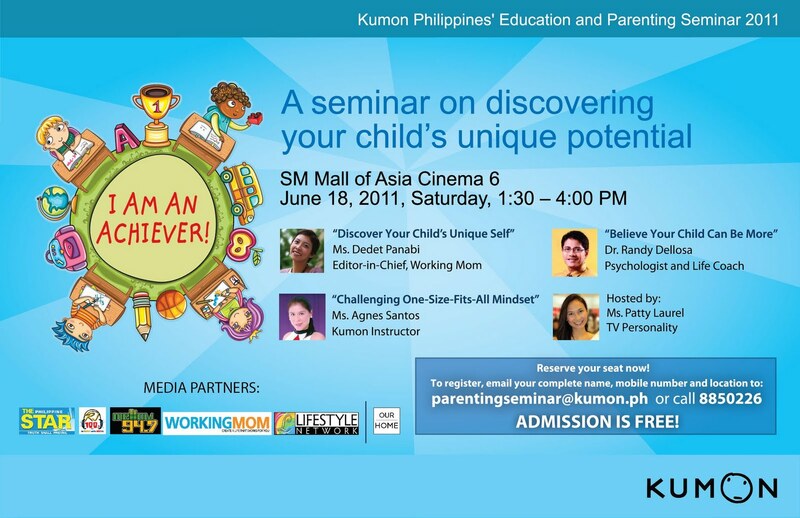 To register, call 8850226 or email parentingseminar@kumon.ph.